Do you ever see things that send your mind into a tailspin? For instance, today on my drive home from D.C., I saw two shoes on the side of the road. And I'm not talking about a pair of shoes. I mean, near Springfield, Virginia I saw a loafer, and near Quantico, Virginia I saw a boot. How does this happen? And if these were the shoes I noticed while driving, how many did I miss? Maybe a married couple drove down the road, windows open, and started arguing. The man got so angry with his wife, he took off his shoe and threw it at her, but it went out the window instead because the idiot had bad aim. Or, the more logical explanation, someone's suitcase fell off their luggage rack--which is exactly why if it doesn't fit IN the car, it doesn't go ON the car--and all of their belongings landed on the highway. This makes sense, but there weren't any clothes. Just a shoe. Whatever the case may be, until I see a shoe fly out--or off--of a car, I'm not going understand this. Maybe we should start a "Save the Shoes" campaign? What does your imagination come up with when you see a shoe resting on the side of the road? I love stuff like this, and often it is the very heart of fiction. 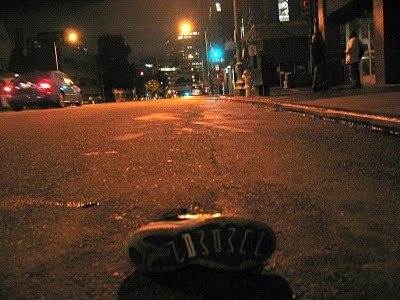 "An abandoned shoe lay by the road. Earlier there had been a foot inside that shoe, attached to a man, but now he was gone..."
Aliens? Portal? Interdimensional space travel? Warts? It's all good. And now I want to know where he went! Do write this story! Maybe they give a shoe for shoe dwarves to eat at night when everybody's asleep? I know this makes me wonder how this happens? Last week I saw a pair of man's underspants against the curb as I was walking my dog. (NoVa) Now how did those get there? He threw them out the window before he got home because he was with another woman? The blue boxer briefs just flew off him? I mean it's not like there is a laundramat in my development and they got out of the basket. It was a head scratcher. That's just so gross. You are the second person to tell me this now that I've written this post! So men's shoes and underwear have a habit of finding the road?! I too think all sorts of things like that... like really how do you loose your shoe and not go looking for it? Where in the World is Krystal Wade?